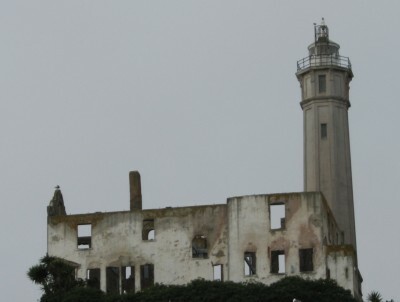 In my last two posts, I described our morning at Alcatraz Island. Once we got back on the ferry to the mainland after our trip to Alcatraz, it wasn’t even noon yet. The day was still young! We walked over to Ghiradelli Square so I could get some chocolates for my co-workers, and we took a couple of photos there. To be honest, I’m not quite sure why Ghiradelli Square always tops the tourist lists of things to do. I had trouble finding chocolate there that I couldn’t find at the grocery store back home… Neither Jon nor I were feeling in the mood for a sundae, so that was a brief stop and then we were on our way again. 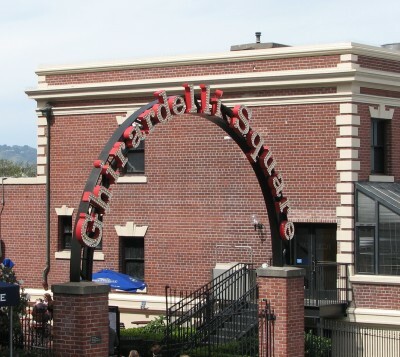 Ghiradelli Square – Why is this a Tourist Attraction? 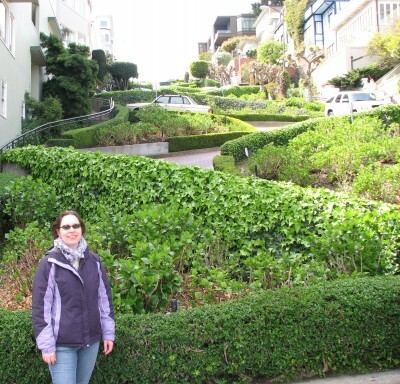 We hiked up the hill to our next destination – Lombard Street, aka “the Crookedest Street.” We were there four years ago, on our first-ever vacation as a couple. This section of the street has 8 switchbacks in one block, in order to make the 51% grade manageable for vehicles! I’m not sure who ever thought that would be a good idea! Apparently there is some dispute about whether it really is the crookedest street – it seems insane that some other city planner somewhere created something similar! It was fun to get pictures at the same place at the base of the street. Strangely, I was even wearing the same jacket! 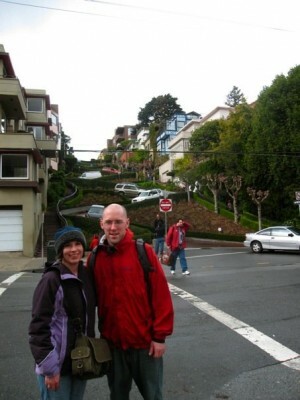 Jon and Me at the Crookedest Street in February 2009 – 4 Years Younger! After Lombard Street we walked over to Coit Tower – another place that we visited on our 2009 trip. 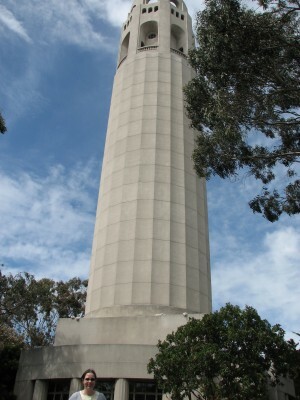 Coit Tower was built to honor the memory of Lillie Hitchcock Coit, who was a wealthy socialite who lived from 1843 to 1929. She often pitched in to help firefighters of the day get their engines up the steep hills of the Telegraph Hill neighborhood, and was well known for wearing trousers and gambling when it was not appropriate for women to do so. When she died in 1929, she left about a third of her wealth (about $118,000) to the City of San Francisco, with instructions to use it for civic beautification. 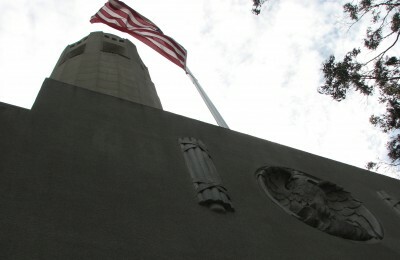 Coit Tower was the selected design from a contest that was held for ideas for a memorial on Telegraph Hill. 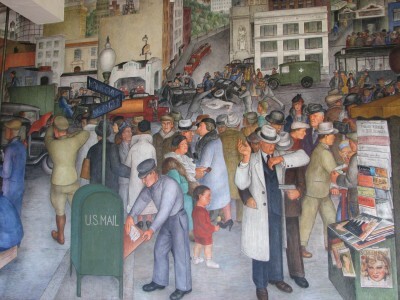 When you go inside Coit Tower, you find that the entire base is decorated with a series of murals, painted as a part of a New Deal employment project by the Public Works Administration during the Great Depression. The murals are amazing – very detailed and well done, and they provide a thought-provoking social commentary that is still relevant today. We spent quite a while going all around the base looking at the murals, but decided not to take the elevator up to the top of the tower on this trip. 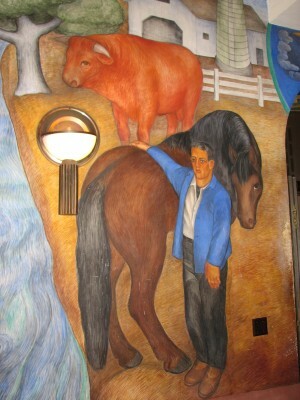 Mural of a Horse at Coit Tower – And a Cow, But It’s Awesome Because of the Horse! 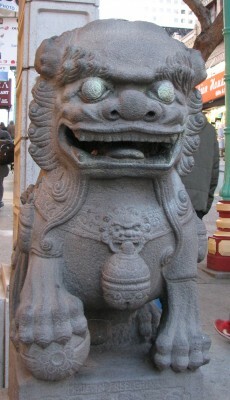 After Coit Tower, we walked back to the hotel, through Chinatown, and rested our legs and feet for a little while. Then we navigated the bus system so Jon could make the trip over to the Haight-Ashbury district for a stop at his favorite record store – Amoeba. The bus driver was really patient with us as we fumbled around trying to figure out which bus to get on, and she even gave us free fares! It is nice to find people who are so helpful in big cities. And Jon loved his record store visit as well (as if you had any doubts!). After our Haight-Ashbury excursion, we had intended to head to North Beach to find a nice little Italian restaurant that we had been to before. But there wasn’t a bus that would take us directly from Haight-Ashbury to North Beach, and we would end up in the vicinity of our hotel again and then have to transfer. As we had been walking all day, and had probably been at least 8 miles at that point, we decided to find something near our hotel. I had seen an Asian fusion restaurant around the corner from the hotel and we decided to check it out. We were not disappointed! We walked into E&O Asian Kitchen about 7, and it was just getting busy. Even though we didn’t have a reservation, they were able to seat us right away at a small pub-style table near the bar. We checked out the wine list and made our selections. I ordered a French Rosé called Triennes, from Provence, which is made primarily from Cinsault with small amounts of Syrah, Grenache and Mourvedre blended in. It was very tart and citrusy, and I enjoyed it immensely. 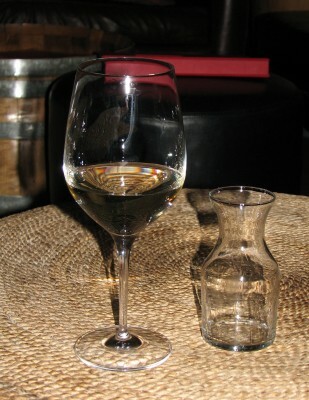 Jon ordered a 2010 Cristom Pinot Gris, an Oregon winemaker – his was good too, with more pear flavor, but I liked mine better. The dish came with pickled vegetables – carrots and cucumbers, which were a nice accompaniment to the rich meats and sauces. We also ordered the local asparagus, which was seasoned with sesame, ginger, miso and egg and grilled. And we had the wood roasted edamame with shiso fumi furikake and maldon salt. To be honest, I don’t even know what that means, but they were amazing edamame! This meal was one of the best of our trip! 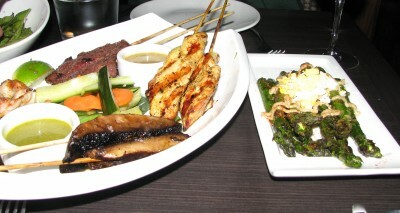 E&O Asian Kitchen – Satay Platter and Local Asparagus – YUM! And with the glow from that amazing meal, we wrapped up another day in San Francisco. I took a bath in the clawfoot tub of the hotel to pamper my overused feet, and reflected on a fantastic day! This morning WordPress informed me that today is my third bloggiversary. I’ve been blogging for three years! 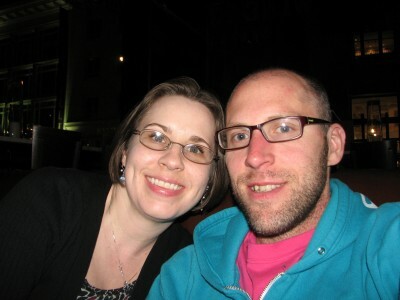 I remember it well – Jon and I were sitting in a hotel room in Goldendale, WA (hoppin’ place!) at a mid-way stopping point between our Yakima wine adventures and our Columbia River Gorge wine adventures on a Memorial Day weekend wine tour. The idea was hatched. We typed and prepped and picked themes and then when we got home from our long weekend – our first post appeared. I think only my mom read it. Thanks Mom for believing in me! Since that first post, I like to think I’ve made some progress. I have had 10738 total views and my highest month so far was January 2013 with 1199 views for the month. My best day ever (so far) was 104 views. I have 91 followers, and most of them aren’t even people I know in real life! And my blog has been viewed by people from 80 different countries. Best of all, I’ve had the opportunity to share my passions with you, my readers, and get encouragement and laughs along the way. I’ve become more comfortable sharing my writing with the world, and maybe I have gotten better at it. Plus I’ve learned a lot, about wine, about history, about places I’d like to visit – and that has made it worthwhile! Tuesday was Biz’s surgery day – I left work at noon and loaded him up in the horse trailer for an afternoon at the vet clinic. 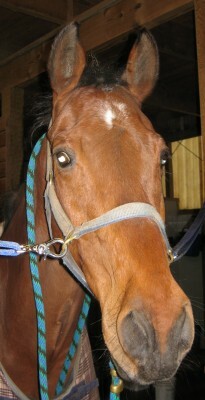 My vet and the equine dental specialist were teaming up for Biz’s latest tooth extraction. If you have been following this blog, you know that Biz had his first tooth pulled two years ago, because he suffers from a degenerative tooth disease called EOTRH. Now, Biz is two years older, 26, and we continue to watch his teeth. About 6 weeks ago, he developed an open sore below this latest tooth, indicating an infection, and it was now time to make a move. We got there and went through the “process”, beginning with bloodwork and the beginnings of the anesthesia. It was raining, so we took Biz inside the exam area right away, instead of giving him the first doses of drugs outside in the sunshine as we had on his previous trips. I think being closed in the treatment area made him nervous, and he danced all around until the drugs took effect. But soon enough, the drugs took hold, and I walked him into the stanchion for the procedure. 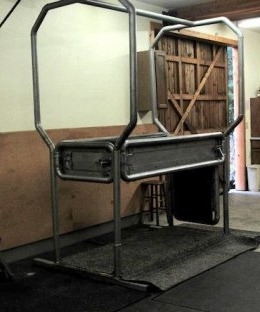 For you non-horsey folks, the stanchion is a holding cell for horses and cows – see photo below – this will become relevant later in the story. Gordon and Bob set about further numbing Biz up, with lots of tiny little novacaine injections into his gums. Apparently, there is almost no fluid in the gums, so you can only inject a little tiny amount each time. It looked like hard work – Gordon was squeezing the plunger on the syringe with all his strength, and he even bent a couple of needles (mom don’t read that part – it will just freak you out…). Then finally, after many tiny injections, Biz was ready for his nerve block – the last anesthetic that would ensure he felt no pain. Now, they were ready. If you read the post about his previous extraction, you know it was quite traumatic, with lots of tapping on a hammer and chisel to loosen the tooth. Well, there are some new tools on the market! Gordon and Bob used a sharp ended tool with a small curved spoon-like end to insert underneath the gum on the side of the tooth. The sharp tool cuts the ligaments that hold the tooth in place, and they can wiggle the tooth to loosen it enough to pull it out. It looked like a much more pleasant experience than last time! So after inserting the tool all around the tooth and wiggling and cutting, it was ready to come out with a pliers. There wasn’t quite as much ooohing and aaahing over this tooth, probably because the ball of hypercementosis was not as pronounced on this tooth. Then we had to do some new X-rays to see where any remaining pieces were so they could make sure to remove them. That’s when trouble hit. Biz was quietly standing in the stanchion and the vets were looking at the X-rays with their backs turned to Biz. I was curiously watching a little mini-horse who was getting an ultrasound in the bay next door. We think Biz, in his sleepy state, leaned forward on the stanchion just a little too much and cut off his blood flow. I heard a noise, turned around and watched Biz drop to his knees! Then a split second later his hindquarters dropped and now he was laying on the ground! He had fainted dead away! Now things are immediately dangerous. Horses’ legs are very delicate, and those support posts on the stanchions are solid steel placed in concrete. If he had started thrashing, he could easily have broken a leg… The vets immediately got to work, and were joined by the vet who had been doing the ultrasound next door. They released the side walls of the stanchion and swung them out of the way. Two vets each grabbed a front leg and started pulling, sliding and rotating Biz away from the steel support posts. Gordon grabbed his tail and pulled it, helping rotate him away. The whole time, Biz lay quietly, allowing the vets to maneuver him away from the posts. He just looked at me with his one eye, seeming to say “Mom, I don’t understand how I got down here?” Once he was clear, he was able to quietly stand up and the panic was over. I’m happy to say that I didn’t panic either, but I was very worried. Since he was still pretty sedated, they didn’t put him back in the stanchion while they removed a few remaining chips of tooth, and packed and sutured the hole. He did go back into it for some IV fluids, as he was just a touch dehydrated. They left the front panel open though, so in case he leaned forward he wouldn’t have anything to lean on. In my last post, I explored the history of Alcatraz Island prior to its time as a federal maximum security prison. But no visit to The Rock would be complete without seeing the prison building. 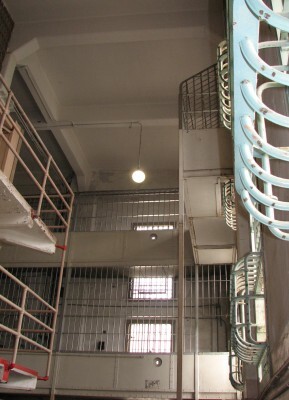 The cell block that visitors see today was constructed between 1909 and 1912, and became home to federal prisoners in 1933 when the Army Fortress was deactivated and transferred to the U.S. Bureau of Prisons. When you visit, you receive an audio tour (available in several languages) with headphones to wander around the prison and hear about the various areas of the prison. The audio tour also gives you information about some of the prisoners that were housed at Alcatraz, their daily lives in captivity, and details about the building itself. The tour is narrated by several of the former guards and inmates, and informational posters give you some details on these men. 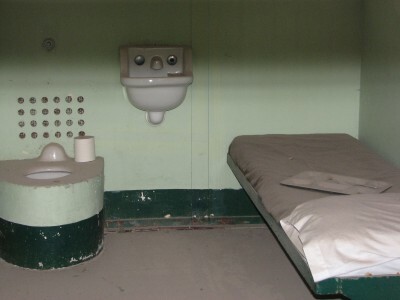 The prison had over 600 cells during its military prison days, but during its time as a federal prison there were 336 regular cells, 36 segregation cells and 6 solitary confinement cells in use. The rest were used as storage. 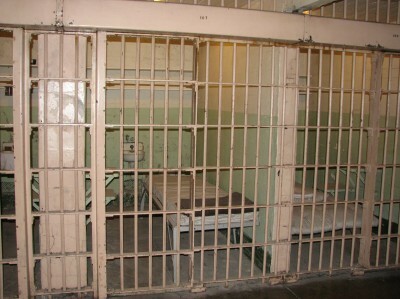 The regular cells were 9 ft. by 5 ft.; smaller than the segregation cells which were 9 ft. by 7 ft. The general population lived in cells along two main corridors, and there were 3 stories of cells looking out onto each corridor. At one end was a gun gallery where guards had a clear view of the corridors and the fronts of the cells. We got to see “The Hole” – the solitary confinement cells where prisoners were housed when they got unruly. In the hole, you were alone and confined in the dark for 24 hours each day – no exercise, no entertainment, no nothing. You didn’t even get a toilet or a sink – just a hole in the floor – YUCK… It was different than I expected though – I thought those cells would be in a basement or dungeon. 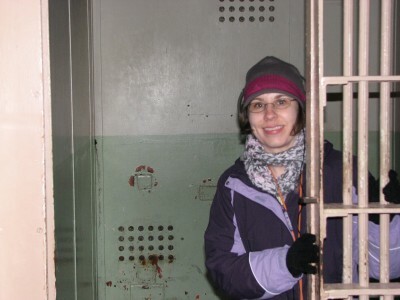 Instead, they were right on the main floor with all the other cells – it only got dreary once they put you in that room and closed the window in the door. The tour doesn’t talk about this, but legend has it that a malevolent presence with glowing red eyes terrorized prisoners in “The Hole” – supposedly one man screamed throughout the night about this entity, but when guards checked to see if he was alone they found nothing with him. However, in the morning the man had stopped screaming and was found dead, with hand marks around his neck. Guards are said to have counted an extra inmate that morning at role call; the dead man was seen in the lineup and then disappeared. And of course, the tour details the escape attempts. During the life of the federal prison, there were 14 escape attempts involving 36 prisoners. Of these prisoners; 23 were recaptured, 6 were shot and killed, 2 drowned and 5 are missing and presumed dead. Three of these men dug out of their cells using homemade tools and spoons, climbed up the pipes through the utility corridors to the roof, made it down to the ground, and set out in homemade rafts and were never seen nor heard from again. 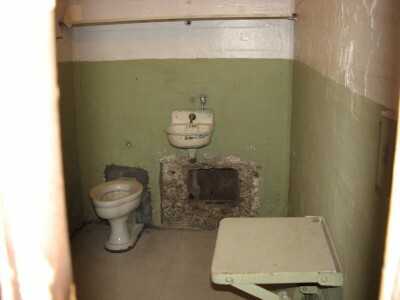 The Cell that John Anglin Dug Out of in 1962. He Made it Off the Island, But Was Never Heard From Again, and Presumed Drowned. The most famous of the escape attempts is called the Battle of Alcatraz, and it occurred in 1946. A group of 6 prisoners (there were 3 ringleaders), managed to overpower a guard while he was searching an inmate who was returning to his cell. They then used a homemade bar spreader to spread the bars that protected the gun gallery (the thinnest inmate starved himself so he could fit between the bars). At this point, they were armed and thought they had the keys to let themselves out. However, a brave guard had handed over all the keys, except the one they needed. He had hidden that one key in the toilet of the cell where he was being held hostage. They were trapped. Meanwhile, other guards were returning to the cell block from duties guarding the prisoners working during the day, and they were captured one by one as they returned. When they didn’t check in, another guard was sent to check… and another… and another… After some time, the inmates had nine guards held hostage. The inmates were frustrated at this point because without the key to the door, there was no escape, so they decided to kill the guards who could testify against them. They fired into the cells were the guards were being held. Five were wounded, three seriously, and one guard, Bill Miller, later died of his wounds. At that point, 3 of the inmates figured they should distance themselves from the situation and returned to their cells; the other three decided they wouldn’t surrender. They got up on top of the cell block to fight it out. The other guards had figured out what was going on by this point, and entered the gun gallery – a massive firefight occurred – one guard was killed and four others were wounded. Prison officials then cut the electricity and waited for night to fall. Guards went back into the gun gallery to provide cover for several other guards who entered the cell block unarmed in order to free the captive guards. The guards in the gun gallery couldn’t get a clean shot at the inmates perched on top of the cell block though, so after the captive guards were freed and evacuated, they called in some heavier firepower – The Marines. The Marines shelled the prison, and drilled holes in the roof and dropped grenades in to corner the inmates. They were eventually trapped in a utility corridor. The Marines entered the building and fired into the utility corridor at intervals throughout the day – the three inmates were killed in the corridor. The three other inmates who had returned to their cells had been identified by the guards, and were tried for their roles in the escape attempt and the murder of the two guards – two were executed and the third received an additional life sentence. As a result of the Battle of Alcatraz, security was increased and there was not another escape attempt until 1956. The prison was closed in 1963, because operating costs on Alcatraz were more than three times what it cost at other federal prisons in the country (more than $10 per prisoner per day vs. $3 elsewhere). 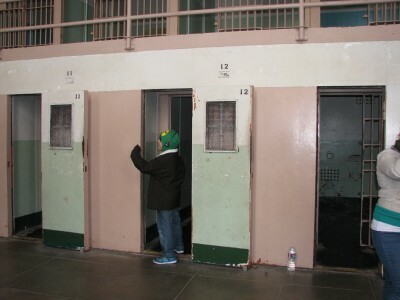 Additionally, residents of San Francisco were becoming increasingly frustrated with the sewage being discharged in the bay from the prisoners and the guards and families that lived there. The last prisoners were moved to other correctional facilities around the country. All in all, Alcatraz is a very lonely place. Inmates in the early years were not allowed to talk, and throughout the prison years, inmates could have one visit from family once a month. Inmates typically worked during the day, but outside of work, inmates were only allowed one hour each day of recreation. The day we were there, it was very cold, and that was on an unseasonably warm, sunny March day in San Francisco. It must have been brutally cold there in winter. 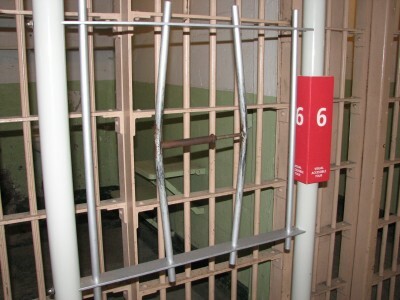 During the history of the federal prison, 15 prisoners died of natural causes, 5 committed suicide and 8 were murdered. 3 guards were also murdered during escape attempts. Even though there are tons of people everywhere inside the prison, the tour is pretty good at moving you through efficiently, so it isn’t as claustrophobic as you might imagine. Jon is frequently annoyed around crowds, and Alcatraz didn’t bother him at all. And of course the other areas of the island are not crowded at all, because people really just want to see the prison. We really enjoyed our visit and it was well worth getting up so early in the morning. If you have the opportunity – GO! But do buy your tickets online, well before your visit! On our full day in San Francisco, we started out by getting up really early to go to Alcatraz Island. I was really looking forward to this part of the trip, and it almost didn’t happen. You see, I looked at the website, and it told me that during the peak season, tickets could sell out a week in advance. No worries, I thought – we were going in March. On a weekday. But I didn’t know quite which days we would be in San Francisco and what else we would be doing there. So, when I went to book the tickets, they were sold out… For the next nine days… I was really bummed! But I did some sleuthing and found some internet rumors that you could purchase same day tickets on a walk-up basis for the first boat each day. You had to get in line early, because they were first-come, first-served. Once the 40 or 50 tickets were sold, the rest of the people in line were out of luck. Luckily, Jon loves me, and agreed to get up super-early to get in line for the Black Friday of Alcatraz Island tickets. Since we were walking, we had to head out from the hotel for the 1.7 mile walk to the pier – at 6:00 am! How’s that for nerdly dedication! The ticket booth opened at 7:30, and we got there at 6:40 – we were the second couple in line, behind a dental student from Los Angeles and his wife (they were friendly and we had a lot of time to chat). The internet rumors were true, and they did have the promised holy grail of walk-up tickets. So, we had tickets on the first ferry to go out to the island at 8:45 am, but you have to get ready to board the boat at 8:20 am. We got on the boat with about 150 of our closest friends and headed out. The trip over to the island was nice; we got some good views of the city and I was able to get some good photos. It was pretty cold though – San Francisco was warm that day – about 65 in the afternoon, but I had to wear my winter coat, gloves and hat during the trip (granted it didn’t help that we had been standing around in the cold for a couple of hours at that point). 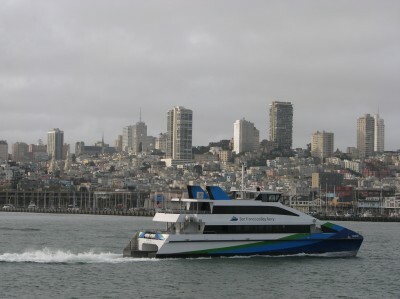 Alcatraz is about 1.5 miles out from the mainland, so it didn’t take long and the ride was pretty smooth. I’m sure that you all know that Alcatraz was a federal prison for thirty years, from 1933 to 1963. 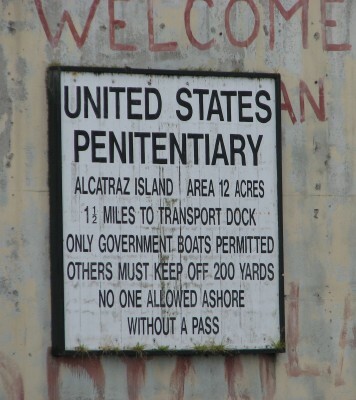 But you may not know that Alcatraz has a history that extends much further back. Alcatraz was first formed when it pushed up into the Bay about 10,000 years ago. The local Indians believed that the island was cursed, but there is some evidence that they traveled out to the island to collect bird eggs. Spanish explorers first “discovered” it in 1775 and named it La Isla de los Alcatraces (the island of the pelicans). The Spanish built a few buildings on the island but didn’t do much else with it. 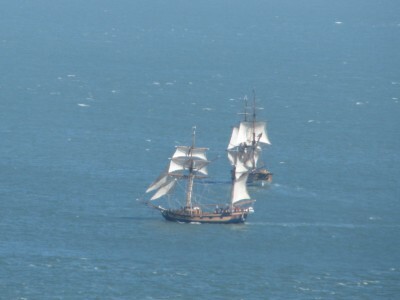 The Americans purchased the island in 1850 and set about creating a military garrison post there; in order to shore up the coastal defenses protecting San Francisco. The lighthouse currently on the island replaced the original lighthouse in 1909, because when the Army decided to build the current cell house structure, it became apparent that the original lighthouse would not be tall enough to be seen over the structure and the buildings and sheds were considered unsightly. The current lighthouse is 84 feet tall and constructed from cement. It was automated in 1963, and is still in use today, operated by the U.S. Coast Guard. While the first lighthouse was being constructed, building was also going on for the military garrison. Eventually the garrison would house about 200 men. 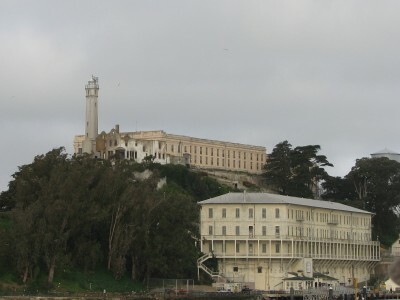 During the Civil War, Alcatraz was used to house war prisoners, which was its first use as a prison. During this period, building continued, and by the end of the Civil War, they realized that the defensive technology being utilized at Alcatraz was largely being rendered obsolete by new advances. It was at that point that officials decided to change the focus of Alcatraz from a defensive structure to a detention site. A brick jailhouse was built in 1867, and the island began being used as a long-term detention center for military prisoners in 1868 (confederates caught on the west coast were among the first military prisoners housed there). It just grew from there. The Spanish-American War gave the island a whole new crop of military prisoners, expanding the population to about 450. 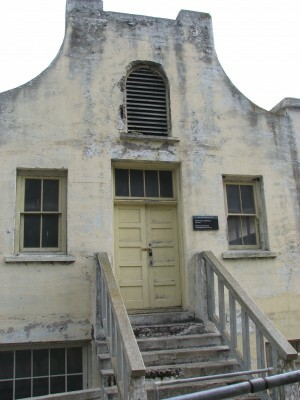 The 1906 earthquake generated the first batch of civilian prisoners, when prisoners from the mainland were transferred there after the earthquake to ensure that they would not escape. During World War I, conscientious objectors were imprisoned at Alcatraz. 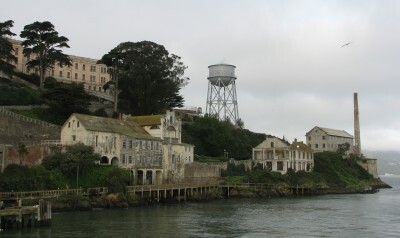 The Island contains several buildings from before the federal prison era – some are still intact and some are in ruins. The original brick barracks, built in the 1860s, were added onto in 1905, resulting in the structure that is seen today right next to the dock. During the prison era, the soldiers’ barracks were remodeled into apartments for the guards and their families. The Chapel was built in the 1920s, but despite its name, it wasn’t used as a chapel. Instead, it was living space for single officers and workshops. The Post Exchange/Officers Club was built in 1910, and was a general store where soldiers could buy goods. During the prison era, it functioned as a recreation hall with a dance hall and bowling alley. Sadly, the Post Exchange, Warden’s House and the Lighthouse Keeper’s Quarters were burned in a 1970 fire during the Indian Occupation of the Island. The light tower was also damaged by the fire. There is still some dispute about the cause of the fire; the official story is that it was accidental. I do find it curious though, because the Post Exchange isn’t near the Warden’s House and Lighthouse; and the Military Chapel is in between and it didn’t burn. I really enjoyed wandering around the island and checking out the ruined structures; and we hadn’t even been inside the prison yet! I’ll post about that next! After visiting Petaluma Adobe State Historic Park, we got on the road to head into San Francisco. It was a bit of a rough and tumble (literally!) drive! We were driving along on the freeway and Jon had moved out of the left lane to allow an SUV to pass us. It had two bikes on a bike rack in the back. And then it didn’t! One of the bikes fell off the rack right into the middle of the freeway lane! Fortunately, there was nobody (especially us!) in the lane behind them, and the bike bounced a couple of times and landed mostly over on the shoulder of the fast lane. Ouch – that’s a pricey mistake! I’m not sure how you would get your bike back. We were feeling especially lucky that we hadn’t gotten into a wreck with a large bicycle, so the rest of the heavy traffic heading into San Francisco seemed like a breeze. 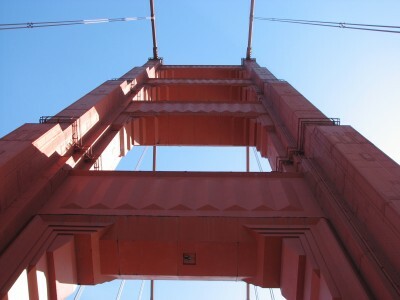 It was slow going on the Golden Gate Bridge, which allowed me to get some nice shots of the bridge supports from the sunroof as we passed underneath it. We got into San Francisco at about 4 and got checked into the hotel – we stayed at the Baldwin Hotel, a historic hotel in Union Square. It is no frills, but close to everything and a great value for the big city. After checking in, Jon’s first order of business was a visit to the Rasputin music store. He could spend days in there, but I finally had to pull him away so we could have some dinner – I really can’t complain though, because I found a couple of classic movies that I have never seen for a good price. Then we got a quick bite to eat at a floating conveyor belt sushi place in Chinatown. The sushi was average, but it was quick and hit the spot. After dinner, we went to the Rouge et Blanc Wine Bar on Grant Avenue across the street from the hotel. This wine bar has an EXTENSIVE wine list. There are A LOT (maybe 50?) wines you can get by the glass, and hundreds more available by the bottle. Interestingly, there website says that they have 60 selections, but I’m not sure if they are just talking about wines by the glass. There seemed to be many more than 60 bottle offerings. They have wine from every part of the world represented. Per glass prices range from $7 to $17, and they had some happy hour specials too. They also have beer, hard liquor, and the wine bar does double duty as a coffee shop during the day. After perusing the menu for awhile and getting some fantastic suggestions from the server, I settled on a 2010 Beaucanon Estate Sauvignon Blanc from Napa, and Jon had a 2011 À Côté Chardonnay from Santa Barbara. We were both very pleased with our choices, and the comfortable couches and bold artwork were a great way to relax away the rest of the evening. I admit it – I’m a sucker. 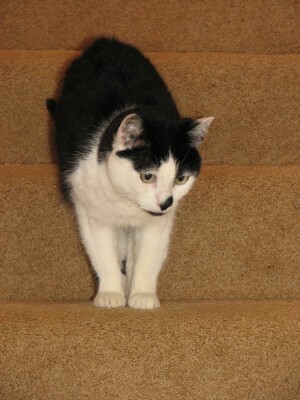 Many of you read with sympathy my recent stories of Martini and her battle with alimentary lymphoma. 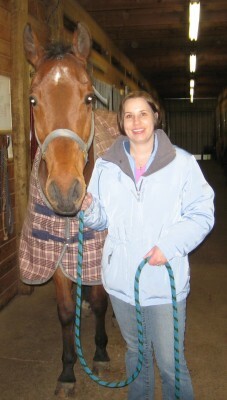 Many of you had very kind words when I made the decision to end her suffering on March 1, 2013. Maybe some of you have tears in your eyes reading this (like I do writing this). So when my horse’s vet told me he had kittens – one little girl who had been abandoned at a farm – I knew I wouldn’t be able to resist even though I tried. I told him I would ask around. I told him I thought two cats was perfect for me now that Martini was gone. That lasted about a week, until Gordon emailed me a photo. I showed Jon. He told me that it was up to me, but that if I wanted a new kitten, he would be okay with that. That’s his way of saying he thought I should get her. So on April 21st, my mom and I drove out to the vet to see her. And hold her and pet her. And bring her home. 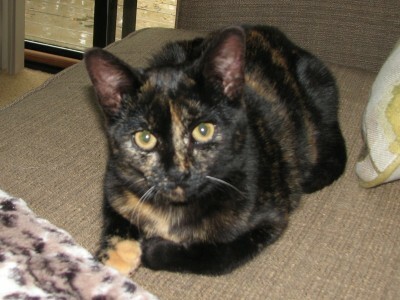 She’s about 6 months old, and she’s cute and friendly and playful. 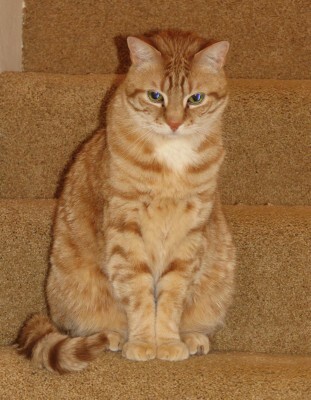 And the boys are fine with her – maybe not thrilled, but fine (after Oliver hid under the bed for three hours once I brought her home). So there’s a new life in the house now. Adding some noise and energy and laughter. She loves her feather on a string toy – Oliver does too. She loves to sit with Jon. She loves to attack your toes under the covers at 5:30 in the morning. Her name is Coraline. Aren’t I the Cutest Thing Ever!? 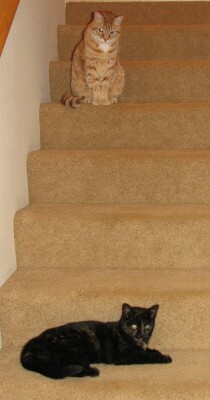 Oliver Is Definitely Not Going Down Those Stairs!